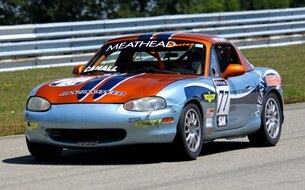 Ted Cahall traveled to beautiful Wampum, PA and the BeaveRun race track to compete in the SCCA 2011 BeaveRun National. The main objective of this trip was to earn a single National point which would allow Ted to qualify for the 2011 SCCA National Championships. Points in a National race are only given out to the top 9 cars that finish. This made the task almost as easy as shooting fish in a barrel. There were only 6 SM cars entered, so the worst Ted could finish was in 6th place - and earn 4 points. Unless, of course, he crashed or broke the car and did not finish at least half of the race's laps to qualify as having completed the race. In other words, in the 30 lap race that would occur on Sunday, Ted needed to complete 15 of those laps to get 4 points and head off to the championships. Arriving on Friday morning about 6:00AM, Ted rented a car and drove out to the track to meet Mike Collins and Karen Dildei. Mike and Ted spent the afternoon sessions doing some lead-follow and Ted acclimated himself to the track fairly quickly. On Saturday Mike decided to run in the Spec Racer Ford (SRF) class. Both Ted and Mike had fairly reasonable qualifying sessions that day for their classes with Ted posting identical best lap times of 1:10.837. Posting identical qualifying times in two different sessions is very rare and the first time that has ever happened to Ted in 3 years of racing. This qualified Ted for 5th place out of the 6 cars - and not too far off the pace of the 4th car. On Sunday, the big day of the race and the determination of the points, Mike instructed Ted to start from the pit. The idea was not go out on the parade lap so as not to take the green flag with the rest of the cars. The logic was simple, no race is ever won in the first corner, but many are lost there. When all of the cars are bunched up in the first turn after taking the green flag, there are often accidents, missed shifts, and cars knocked out before they even complete their first lap. By making Ted start half a lap behind all of the cars, he was ensured a smooth start and would not over-extend himself possibly trying to hang on to much faster cars. The objective was to get a single point - and not to go wheel-to-wheel with any of the other drivers. After lap 15, Mike got on the radio and let Ted know he was officially qualified to race in the National Championships again in 2011! An exciting moment - and the OK to chase down some of the cars in front of him. One of the faster SM participants broke a spring and was knocked out of the race, and the #6 qualifying SM car was now within Ted's site. Three to four laps later Ted was able to pass the last place Miata and move into 4th place. Fourth place is worth 6 points and each car that finishes behind the competitor is also worth a point - so this was an 8 point adventure for Ted and brought his National Total to 29 points (with 22 required to qualify for the championships). Not a bad finish considering he started a half a lap behind all of the cars and could not even see most of them for well over half of the race. As always, a huge thank you goes out to Karen, Mike Collins and Meathead Racing for their pit crew services!